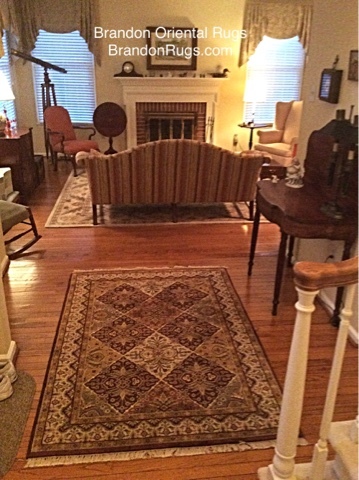 BrandonRugs.com - 4x6 Hand-knotted oriental rug selected by our customer for her lovely town-home in Lower Gwynedd, PA completes a small entry hall that she felt would benefit from the addition. 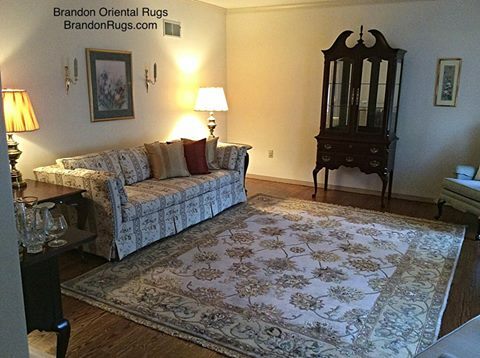 Prior to placing the rug there, she said the space looked empty, and was way too noisy when her pets ran through. Her selection beautifully coordinates with the sofa fabric, and is harmonious with the character of the living room into which it leads. Having a number of floral style rugs elsewhere in her home, she really wanted a geometric look for this piece, and we helped her find this rug. It has rectilinear character and interesting asymmetries, but isn't too coarse or rustic for the tasteful refinements found in the remainder of her decor. A couple of design lessons are in evidence here. Nature abhors a vacuum: empty spaces look empty and beg to be filled. Distinct areas with distinct functions (especially when adjacent to one another) deserve distinct looks. Well-coodinated but distinctly different is more interesting and appealing than perfectly matched and almost all the same. The contrasting mix of geometric with floral and darker with light might seem risky, but can be a risk worth taking as seen in our customer's example. 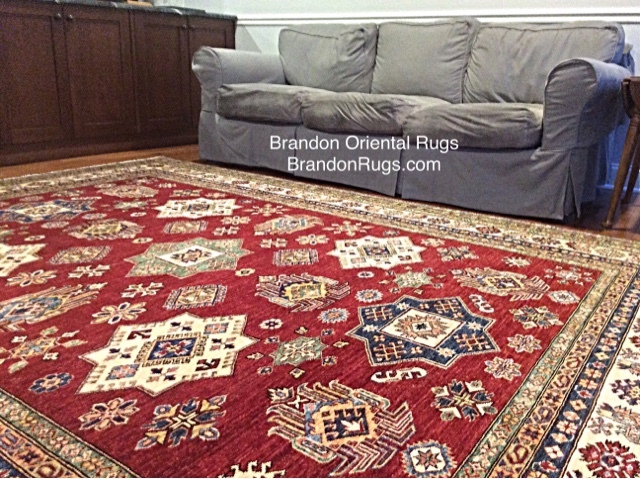 Hand-knotted Pak-Kazak rug selected by Spring House, PA customer of Bucks County, PA rug store Brandon Oriental Rugs - www.BrandonRugs.com - to complete a newly finished kitchen/family room renovation of her townhouse. Originally intended to be smaller, this 8x10 rug successfully fills the room, and in so doing integrates every visual and spatial cue offered into an harmonious whole. The cool gray tones of the sofa and soapstone countertop are dramatically balanced by the vivid red background color of the rug. The sofa's cool gray doesn't extinguish the sizzle of the red rug. The vivid red rug doesn't cause the sofa to become some amorphous block of ice melting to insignificance. Life happens at the interface where change occurs. This family room (newly renovated and decorated by our customer in Spring House, PA) is alive with expectation of the lively events of life it will host. 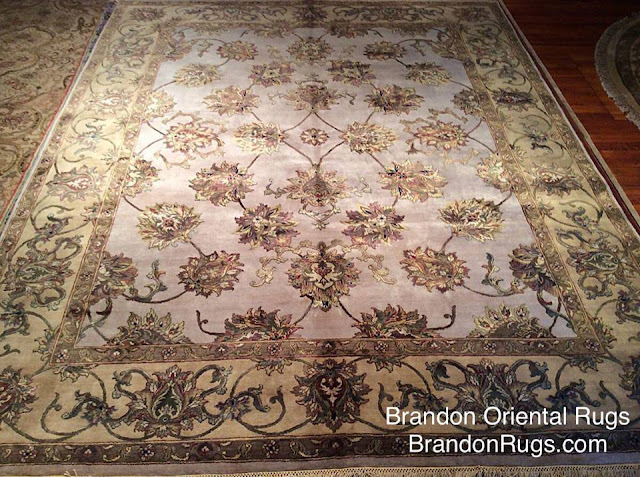 If you are looking for an authentic fine quality handmade rug to complete or advance your plans for a room you are decorating; or need help with cleaning, repair, or appraisal of a rug you own, please call Brandon Oriental Rugs and discover the difference our honest commitment to quality and service will make for you. New Horizons (Outside above Listed Areas)? Invite us to help you. We look forward to opportunities to explore new horizons. If we cannot help you with direct-to-door service, we are always pleased to answer questions and offer suggestions of value to you relative to your interest(s) in fine quality handmade rugs. Please call (215-794-2300) if you need help. 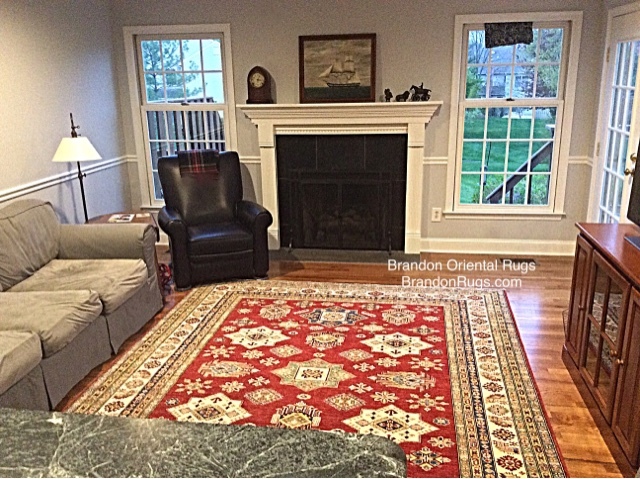 Brandon Oriental Rugs - www.BrandonRugs.com - a specialty oriental rug store in Bucks County, PA (near Doylestown, Peddlers Village and New Hope) recently delivered and installed an 8x10 Silk Flower India Agra design rug to Lehigh Valley, PA customers (with a lovely home north of Allentown) who selected it to advance their living room redecorating project. 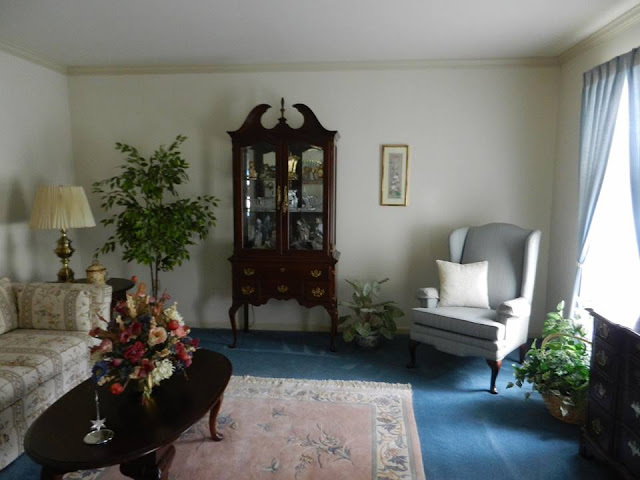 Brandon's customer decided to replace a blue/rose palette for the room (see "BEFORE" image below) and accentuate the yellow and light spice colors found in the sofa fabric. 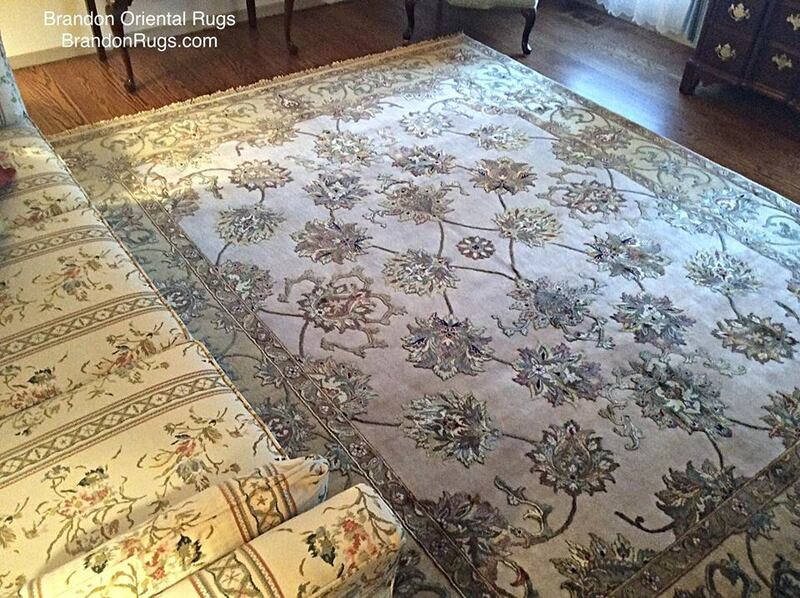 The rug selected is an 8x10 hand-knotted India Agra design rug - crafted according to a "12/12 Jaipur Silk Flower" contract. 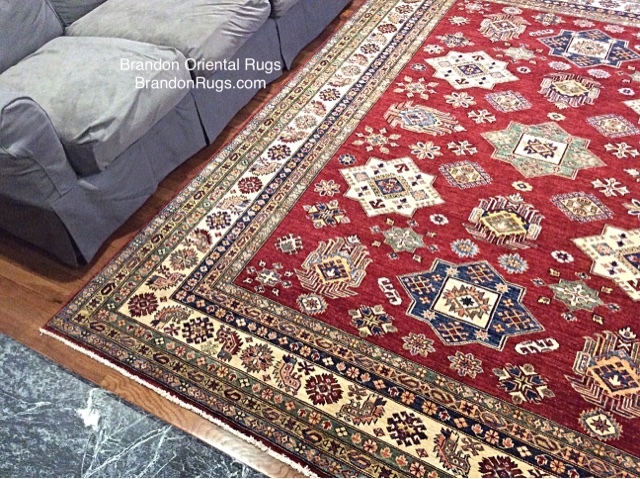 Brandon Oriental Rugs serves a large local territory to assist customers interested in acquiring fine quality handmade rugs as shown in the list of areas served.